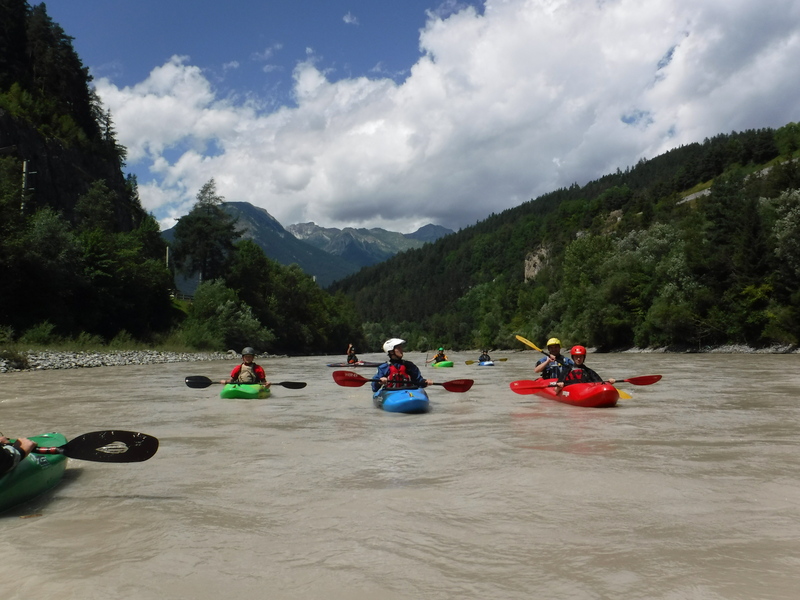 After returning from a great week away last year we aimed to do the same again so since before Christmas we had been planning a return trip out to Au stria for a week of white-water kayaking. The size of the group kept fluctuating but with 2 months to go we were settled with 9 people (Myself, Sarah, Jason, Joy, Tom Tom, Chris, Dave, James and Alex). Finally after weeks of waiting the departure date arrived. Myself and Sarah were planning to take a more sedate 2 days to do the 800 mile drive where as the other team were doing it in 1 long day. By Thursday evening we had all arrived at the campsite in Austria just outside a village called Prutz, right on the bank of the river Inn. Camp was established, tents were erected and a big group shelter put up, as well as hammocks and roof tents. Plans were now afoot as to what to paddle. With it being so late in the paddling season there wasn’t much choice other than the many different sections of the mighty river Inn which stretches for a good few hundred miles with many dams in-between and even country borders. 6am and everyone is awake, mainly because the church bells in the village go off at that time. This was shortly followed by everyone cursing as they remembered about the bells. Breakfast was sourced from the local bakery, pots of tea were made and drunk and packing of paddling kit started. We made the decision to have one easy paddle on what is called the “Pfunds” section of the river Inn. Cars loaded, faff faffed and off we drove to the get in (just inside Switzerland). A bit more faff, a quick shuttle and we’re ready to paddle. Paddling on this water is completely different to the UK, mainly because there is much more water and bigger obstacles rather than tight obstacles to avoid like the UK. This section is only 9km or so and takes around 2hrs, a great little warm up on a fun grade 2 (3) river. Upon approaching the get off, I mentioned to Chris about there being a more full on section just downstream which ends in the campsite. He was keen. Turns out he was more than keen. Once everyone else had loaded the cars they headed off to intercept us and take photos while we set off on what is called the “Tosens” section, a fun bouncy grade 3/4 run. This was navigated without any mishaps other than me not having my spraydeck on completely. This section finishes at the campsite so it’s only a 1 minute walk back to the tents with your boat. Washing lines constructed, kit hung up, BBQ’s lit, beers open and we’re ready to work out what to do the next day and looking forward to the fact we have 6 more days of this to come. 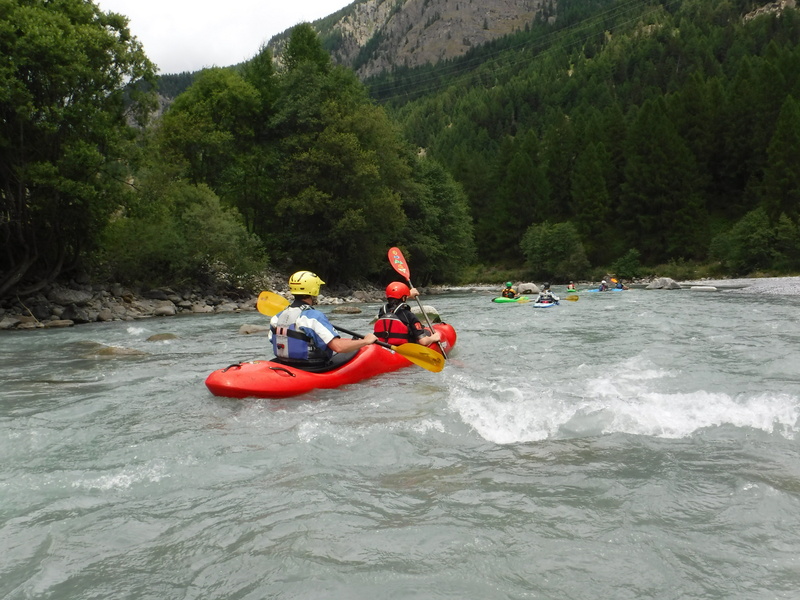 The second day saw us paddling a section called the “Imst Gorge”. This is very popular with rafters and is made up of fast flowing high volume water and although it was at a lower level than it was last year it was still a good level. With myself at the front and everyone else behind we played follow my line through the bigger rapids. One wave did cause a slight problem with both James and Jason as they had the first out of boat experiences of the trip. Dave and Alex in the Duo managed to get down in one piece. The only casualty was a sling that managed to magically disappear to the bottom of the murky river. Back to the campsite, kit hung up, tea brewed and it was time to decide what to eat for dinner. Just at the top of a massively steep hill, right by the campsite, is a great family run pizza restaurant. As Tom Tom unfortunately had to leave us, we decided to go up the hill for what is one of the best pizzas you may ever have. Sunday we decided to try a new section that had been recommended to us by a guide we met on the trip last year. It was around an hours drive into Switzerland but would be good to check out. Boats loaded and with a reduced number of people (some people wanted a rest and fancied a day in the pool and sitting with a book) 4 of us were off to Switzerland to try the Susch section of the river Inn. We passed the border crossing with no problems, even though we’re still not sure if we should have stopped for the policeman at the border, we just kept going. Once the get in was found and cars shuttled, it looked like it was going to be a bit of a scrape. 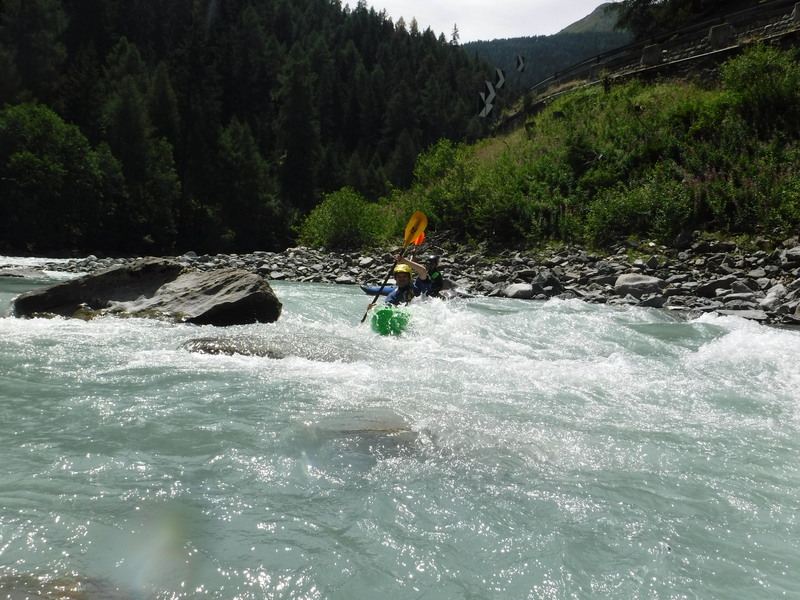 This was in fact true for the first few km’s but after which it picked up into a great grade 2 white water river with nothing to catch you out and great for practising all white water skills. It would have been even better with more water in it. According to the guide book, we were padding it with only around 3 cumecs of water compared to the normal 20 cumecs. A great little river none the less and although the get-out was a bit of a climb we now know of a better one just downstream. The drive back to the campsite always passes through breath-taking scenery and usually finishes with a stop at a supermarket to buy food for the BBQ and some cold beers. Monday morning and as with all mornings we rise from our tents asking who was woken up by the bells, who’s airbed lasted the night, why do the builders need to start drilling at 8am and why do the cars go past so fast so early. With tea on the brew, rivers again were being discussed over breakfast. The idea was to try and get 2 rivers in today. This is doable but needs co-ordination, prior planning and reduced faff. For the first few moments everyone is all go, sorting out kit. After a while everyone seems ready although the boats have only just started being loaded and the boats on top of the trailer box will need to come off and back on a few more times yet. Faff is in fact no ones fault, it’s just something that happens, it looks like a lot is being done where in fact nothing is really being done. Although everyone is busy doing something, no one has any idea where the time goes to. Faff needs to be planned into all trips otherwise you will miss out on getting perfect timing. 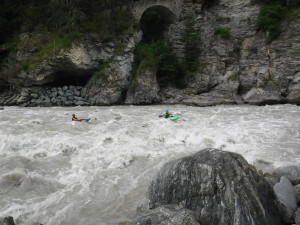 Anyway, faff compete and we’re off to run a new section of the Inn back over in Switzerland called the Schuls Gorge. This was a great little find that was pointed out by our chief river advisor Sarah. Sarah was at all times the one knowing about any river’s current level, its ability to be paddled, the different sections it’s split into and general knowledge of all things needed to go boating each day. The river started with a grade 4 section 200 meters above the main get in which started around grade 2+. Myself and Chris ran the Grade 4, met up with the rest of the group and a moment later we’re off. This is a great little read and run river. I really enjoy new rivers like this as we knew nothing big was round the corner apart from one small section we planned to inspect. One feature appeared and caused a slight problem with both Sarah and James doing a simultaneous roll and Joy calling it a day. We carried on down to the rapid I had seen from the road and after sorting out our lines down, off I went. The duo was next with Dave and Alex performing a great little move sliding down the rocks and some massive support strokes, its just a shame my camera didn’t pick it all up. 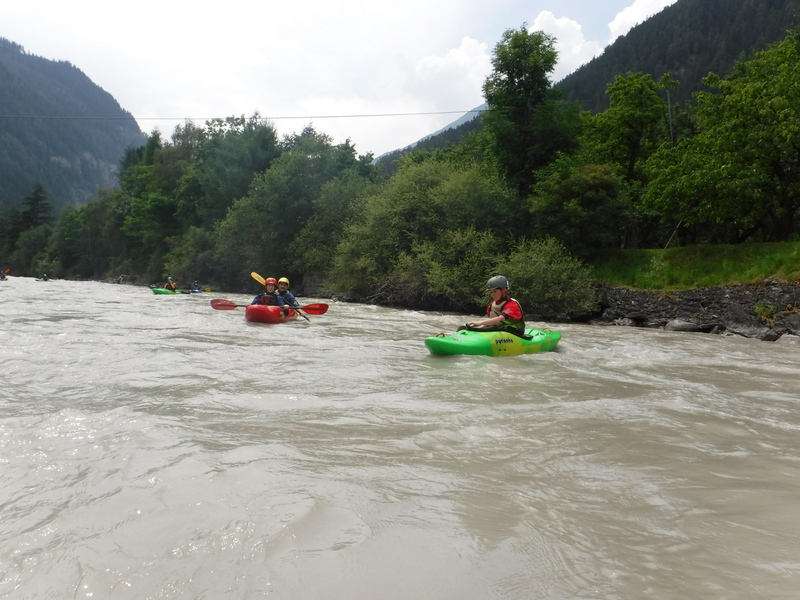 River completed, we’re all l oaded up and on the way to river number 2, back in Austria. We planned to do the “Pfunds” section again where you get in at a Quarry. This time Sarah and Jason had a go in the Duo and I took my smaller play boat just for a bit of fun. 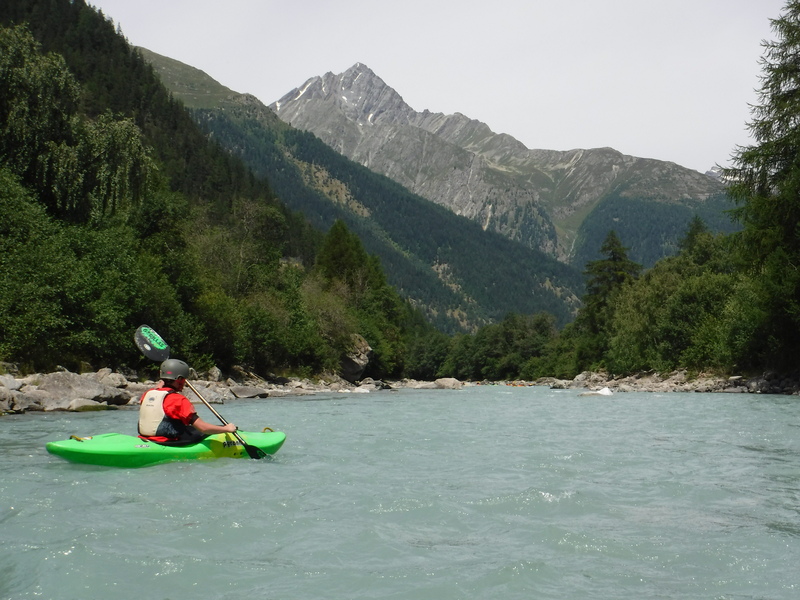 The levels of the rivers change by the hour so every time you paddle it’s usually a different feel and different features appear and disappear. Once we got to the end without mishap, Chris and I were keen to paddle the Tosens section for a second time and asked Dave if he was interested. He was. Great news, let’s go before he changes his mind, we thought. After a quick boat change by myself into my bigger boat we’re off, with Dave following me and Chris following behind. This time there were a few more rocks making some more exciting stoppers and waves meaning we had to be very switched on. Dave and Chris managed with only a few big support strokes. I’m not sure how much breathing was going on by Dave on the way down the first raid as he took some big breaths when we pulled into the first eddy for a quick rest, although smiles all-round was a good sign. Back at the campsite, the BBQ was lit and the beer was open. Sarah and I had planned a day away from the river doing something called via-feratta. This is where you climb up a route in the rock face secured by a steel cable. You have to clip and unclip your karabiners past points in the wire every few meters. 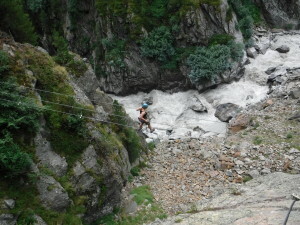 The routes usually take you over wire bridges and vertical rock. Joy planned to join us and Chris who was afraid of heights fancied a go as well. It was an hour and half drive to get to the place and we needed to hire some kit so first thing in the morning we were off, this time going East across Austria. Kit and breakfast sorted, we arrived at the first place. As is usual, it was a fair walk in. Once at the start, we kitted up and I explained to Chris how it all works (it’s just like go ape). 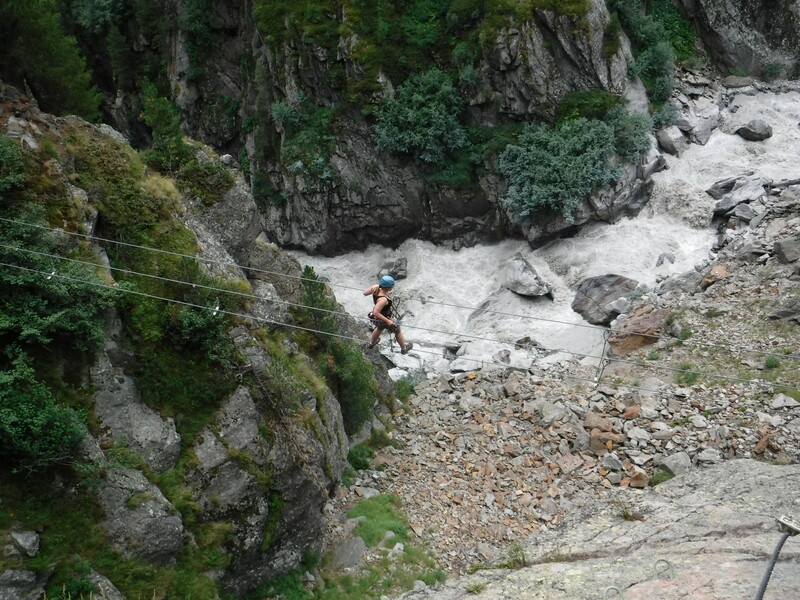 We were then off, straight across a wobbly wire bridge around 80 meters above a gorge of massive white water. Chris managed just fine which was a good sign. We then had some steel steps to climb up, rock sections to walk past and 2 more very wobbly wire bridges. One of which saw Chris stop in the middle to have a word with himself. I couldn’t believe he actually managed to cross it but he did so a big pat on the back when we got to the other side. Some more climbing later and we had finished. It was then a further 20 minute walk back to the car. The plan was to stop on the drive back so Sarah and I could have a go at another via-ferrata. This one was a few grades harder and a lot more exposed so we dropped the other two at the local town and we set off to complete the best one we have done yet. It involved so much more arm strength as well as being really exposed compared to the last one. Once at the top. we met up with the others and headed back to the car to return back to camp. The rest of the group had been on what sounded like a slightly disappointing trip to St Moritz. After a hard day climbing we decided to go to the Pizza place at the top of the hill again as there was so much on the menu still to sample. Wednesday morning arrived with the usual 6am bells, 8am builders and much traffic noise in-between. With only 2 days of paddling left, it was decided that we would paddle the Susch section again but with the rest of the group this time. After the usual faff, we’re off to Switzerland looking to find a get out to extend the original section. After getting a little lost we ended up driving down a road with a big sign stating that we needed the permission of the police to drive down. Obviously we didn’t have such permission but thought it would be fine as it was in the middle of nowhere. This was until we drove past an isolated building to find it was a police station. Anyway, not finding anywhere to get out we only managed to extend it by around 2km, turns out the extra 2km were worth it though. A great little paddle, although the river was still as low as the last time it was still good fun and everyone seemed to enjoy themselves. Throughout the week Chris and I were trying to paddle the only bigger section of water that was running as many times as possible and were trying to think of a way to take Sarah with us. I couldn’t take her in the Duo as there would be no one to rescue or find the lines down. Chris then offered to take Sarah down in the Duo with me leading at the front, perfect. Sarah was also very keen on this option. We knew Thursday was the last day paddling so we aimed to get up early and do a quick run before everyone else was even awake. 8am and we’re at the side of the river, only problem was there was no water, it was empty as we had arrived too early. We then had to find something to faff over while waiting for it to rise. 45mins later, a new headlight bulb in place but still no change in water levels, we were back at the campsite. We all decided to paddle the Imst gorge again so loaded back up and we were off with just a quick stop on route to tie my boat back onto the roof as it had decided to come very loose on the motorway (luckily it stayed where it was). An event free trip down the Imst section with a great little roll from Joy as she dodged a rock at the top of a rapid being the only incident we had. On the way back we managed to work the logistics out so that we could stop and paddle the Tosens section. It was a great paddle with me up front and Sarah and Chris in the Duo just behind. Due to the size, the duo can punch through a lot of big features. However, it is difficult for the person at the back to see where they are going without turning the boat sideways slightly. As such, there were a few sideways near misses with some of the stoppers, resulting in a lot of “paddle hard” commands coming from the back of the boat. Getting to take the duo down a grade 4 section of water and for Sarah to see what we had been paddling all these previous times was a great end to the week. It was then back to the campsite to begin packing up ready to leave on the Friday morning. Friday morning and everyone was leaving. Sarah and I were stopping for two more nights at a campsite in north Belgium to get a days climbing in, where the other two cars were heading straight back to Northampton. All in all my car did 2250 miles which was nearly 50hrs of driving. The final costs are still to come back from the other group who pooled a lot of the costs together. However, I expect our trip was more expensive than the other members of the group and the final cost for us was less than £300 each for the whole 12 days. One of the campfire discussions was where to go next year and most people seemed keen. I think we may change and go to Slovenia instead. I personally haven’t paddled there yet but it comes on good recommendation from the rest of the group. If you think you might be keen on joining us please feel free to let me know and we can keep you up-to-date with any plans for a 2016 trip. A big thanks has to go to Dave for doing the bulk of the organising.